I'm a Marvel guy for the most part, having grown up on X-Men and Spider-Man, though I have a deep appreciation for Batman. My interest in DC is oddly on the fringes, with stuff like The Spectre, Sandman and Ragman and series like the old Checkmate. 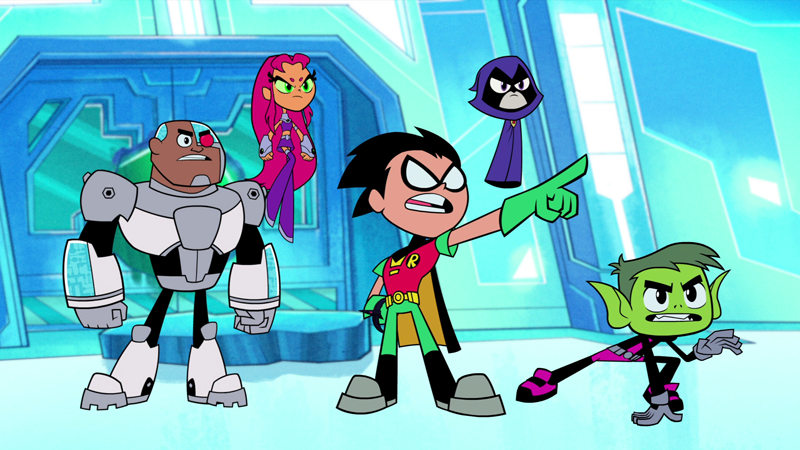 But there's one mainstream DC franchise I am all in on and that's Teen Titans Go!, the animated comedic take on DC's JV Justice League, which airs on Cartoon Network. 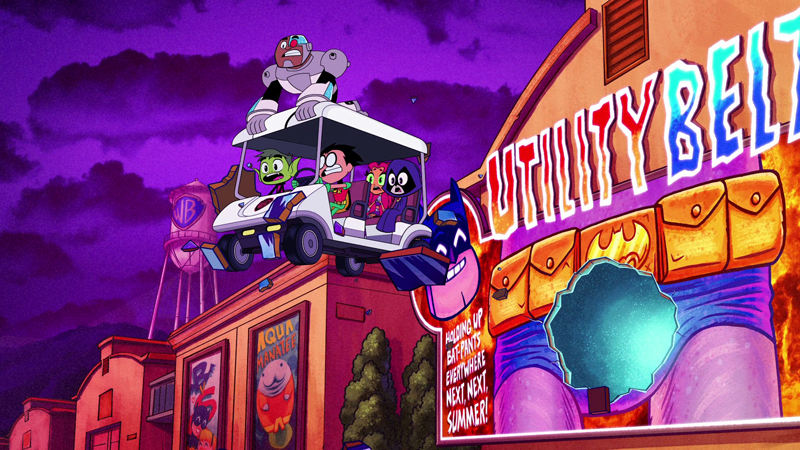 Though aimed at kids, it's full of surreal and offbeat touches, is obviously packed with ‘80s nostalgia for older audiences to enjoy, and offers a fun version of super-hero team-ups, with Batman's sidekick Robin leading naive alien princess Starfire, shapeshifting Beast Boy, the self-explanatory Cyborg and demonic Raven. It is no surprise that the popular TV series made the leap to a full-length movie, with a built-in audience willing to watch more of Robin and company goof around and sometimes fight crime. The only thing needed was a plot that would work at that scale. For a show in which meta references is a first language, the idea that the ever self-absorbed Robin would be frustrated that his team is the only super squad without a movie made for the perfect storyline. When it's explained to him by superhero-film director Jade Wilson (Kristen Bell) that the team needs an arch nemesis to be taken seriously (after members of the Justice League have to bail out the Teen Titans on a mission), it drives the Titans to make Will Arnett's Slade (a family-friendly renaming of the violently-monikered Deathstroke) the first in their rogues gallery. As with the show, music is a big part of this film, with a number of delightful numbers to enjoy, including the group's over-the-top introductory rap, a killer electro rave and a Michael Bolton-sung anthem. It's amazing how catchy and amusing the music can be, on the level of The Lonely Island, but with the plot-advancing capabilities of a Broadway number. 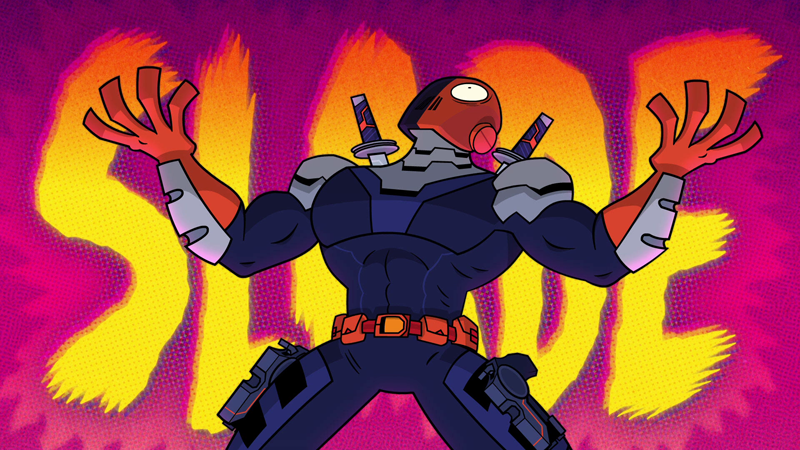 Of course, the irreverence that powers Teen Titans Go! requires that the songs are pretty surface, but that doesn't make them any less fun. In a nice touch, the musical numbers are often accompanied by a change in animation style, resulting in scenes like a fantastically fun Lion King homage. The anarchic creativity that makes the TV show so scattershot thankfully carries over to the film. Teen Titans Go! tro the Movies arrives in a two-disc set (one Blu-ray, one DVD), packed in a standard-width keepcase, which is held in a holofoil-embossed slipcover that repeats the cover art. The Blu-ray features yet another bland Warner Brothers static menu with options to watch the film, select scenes, check out the bonus features and adjust the set-up. Audio options include English 5.1 DTS-HD Master Audio, 5.1 English Descriptive Audio, and Dolby Digital 5.1 French, Spanish and Portuguese, while subtitles are available in English SDH, French, Spanish and Portuguese. A digitally-created 2018 cartoon is about as ideal a source as you can ask for when it comes to the transition to Blu-ray, and the bright bold colors and thick outlines of the film's primary animation style look outstanding on this disc. The 1080p, 1.85:1 AVC-encoded transfer is just beautiful eyecandy, with plenty of fun details in the background that the fine detail shows off, while the textures in the backgrounds and sets--not to mention the crafts-- are delivered perfectly. There is some minor pixelization along hard edges and on thin lines in select spots, but for the most part this movie looks gorgeous and is free of any noticable digital distractions. Considering all the music and action in this film, the DTS-HD Master Audio 5.1 track on this disc should really bang, but it doesn't have the punch you'd expect, particularly in the big action scenes and the heavier musical numbers (like a bass-heavy dance sequence.) The LFE is there and offers a bit of support, but big impacts in the film aren't matched aurally. Other than that, it's a very enjoyable listen, with crisp dialogue emerging mainly from the center channel, while the surrounds offer very healthy instrumentals from the score and music, along with well-placed and active sound effects, as well as effectively positioned voices, helping to fill out the sound stage. There are a few spots where the placement of voices could have been simplified, but that's really nit-picking when it comes to a quality mix that's appropriately prioritized and impressively clear. The extras kick off with the "Go!" music video, by Lil Yachty, featuring an animated version of the rapper. This song is infectious, and the animation is fun, so having the opportunity to listen to it outside of the film is great, but the version in the film is even better, so it would have been nice to get that on its own. Three more songs from the film--"Go!" (titled "Rap" here), "Inspirational Song" and "My Super Hero Movie"--are available in the "Silkie Sing-Alongs" section, which feature karaoke-style on-screen lyrics, with Starfire's pet Silkie acting as the bouncing ball. All they needed to include was "Go! ", but the others are welcome to stick around. "Red Carpet Mania" (2:10) sees the Titans and their castmates on the red carpet doing interviews about the film. It's just a promo for the movie, touching on the key selling points. 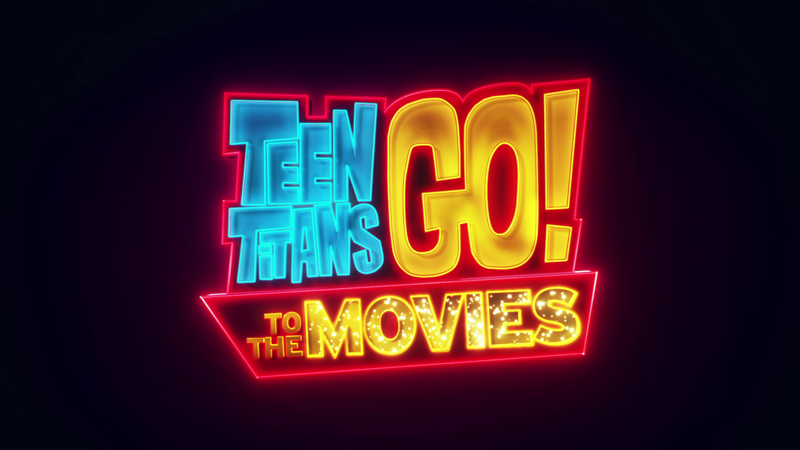 "Teen titans Go! : WB Lot Shenanigans" (3:56) is an amusing little Benny like live-action adventure with mascot-style Teen Titans running from the security guard on the WB lot. Something about those mascot costumes is just plain adorable. "Everything is Fake" (:51) is a cut song by Starfire, that is presented with animated storybords. It's a catchy tune, but far too short to be a musical number. The 2:18 "Teen titans Go! : Translated" shows how a number of lines by the Titans sound in a variety of different languages. Though it's interesting to hear how the characters sound in different voices, the inclusion of a legitimately funny joke tops all translation showcases that have come before. Storyboard Animatics (2:41) offers a split-screen look at the animatics for two of the big action sequences. Though the scenes ended up animated much the same way, there are some interesting details to note that didn't make it into the film. In the package, you get a code for a digital comic of Teen Titans Go! and a MoviesAnywhere code for a digital copy of the film. Is Teen Titans Go! to the Movies a good film? It's OK. Is it a good time? Without a doubt. Made with the same sense of silliness and irreverence that makes the show so much fun, the film is just bigger and more focused, with an entertaining meta commentary on the world of superhero films (that is very on point.) The creative freedom enjoyed by the filmmakers results in n enjoyable watch for all audiences that dig a goofy superhero adventure. The Blu-ray looks and sounds fantastic, and has a small selection of extras that are worth a look, but fall short of what older viewers might be interested in. This is a disc that will get plenty of future rewatches, especially for families looking to share a good time.